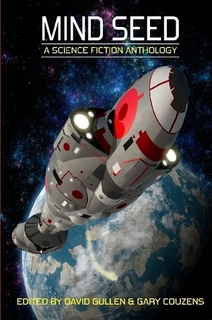 Mind Seed, a science fiction a nthology edited by David Gullen and Gary Couzens, is now out. This anthology was put together by members of T-Party Writers in London, in memory of our member Denni Schnapp, who died in January 2013. The stories reflect Denni’s interest in hard SF, biology and ecology. The proceeds go to Next Generation Nepal, an anti-child trafficking charity. My contribution, “Living in the Vertical World”, was inspired by images of vertical agriculture and gardening. I’d been posting photos on Facebook on the subject for some time. There is a world-turned-upside-down quality to them that provokes wonder – or is it the world turned sideways? As you’d expect, there are lots of arguments about whether vertical agriculture is viable. Some of the ‘visions’ do appear rather gimmicky and technocratic. But the general idea is fascinating, and some vertical schemes look very cool – for fictional purposes, anyway. This website has some great photos, both real and imaginary. I was also following the cases where Monsanto patented seeds and prosecuted people for alleged patents violations if the wind happens to blow the wrong way, and I recently come across this article in Common Dreams about the state agricultural department prosecuting a local seed library in Pennsylvania. And then I read about the world’s tallest squat, the Tour David in Caracas, Venezuela. And it all came together in my story. Mind Seed will be launched at LonCon on Sunday August 17, 5-7pm in the LonCon Fan Village. You can find us in the marquee labelled ‘Beijing in 2016’ on this map. In the meantime, here’s the table of contents for Mind Seed.